The Linnum range of linear drainage is slimline and unobtrusive to the overall bathroom design, yet it’s simple and quick to install. The channel can be adjusted to suit the majority of floor voids down to a minimum of 95mm, so it fits even where there are shallow floor voids. It can be adapted to accommodate tiles from 7mm to 16mm in thickness and offers a choice of two waste outlet adaptors, compression or solvent, for great installation versatility. To meet the current trends of sleek and sophisticated bathroom finishes, the Linnum range includes a choice of grate designs in stainless steel and glass to suit any design. It comes in three different lengths – 650mm, 750mm, and 950mm – to fit different sized areas of the bathroom. Multikwik’s stainless steel continuous channel drainage is ideally suited for changing room, swimming pools or gym applications. Despite its compact height, it can cope with flow rates of up to 0.8 l/s. Its discreet stainless steel grate offers an unobtrusive finish. Multikwik’s trapped shower gullies for tiled and vinyl floors are the latest addition to the floor drainage range. Both versions offer a choice of grate designs, offering different styles and material options and come with the choice of 50mm or 75mm water seal depths. 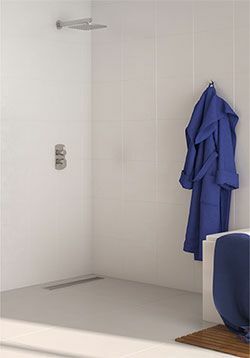 In addition, the tiled trapped shower gully can be adjusted to the majority of floor void heights, by cutting the adjustable riser to the required height. For design and installation queries, Multikwik’s team of plumbing design engineers can offer full technical advice and support. Full details of the Multikwik range, along with comprehensive, downloadable literature, case studies, technical information and nearest stockist information can be found on the company’s website at multikwik.com or by calling 01622 852654.